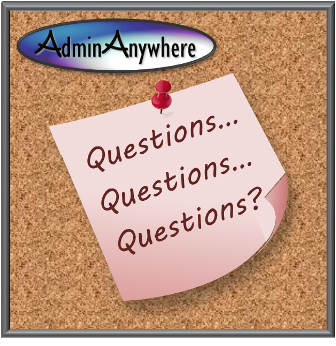 Why should I use AdminAnywhere? 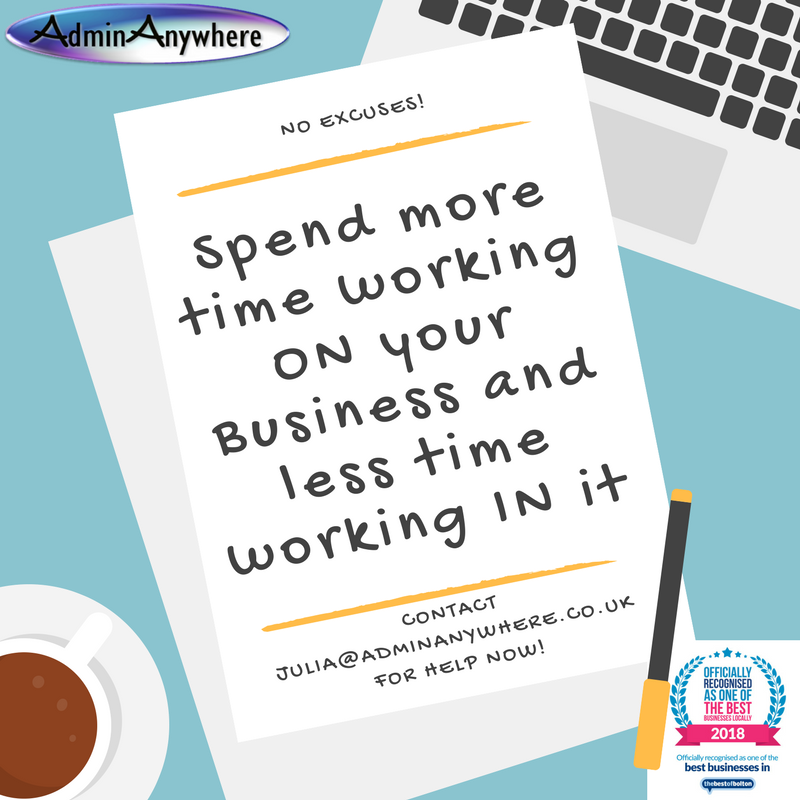 Julia at AdminAnywhere provides a friendly, professional and reliable admin service, at a very competitive rate. Julia brings a broad range of skills and expertise to provide a cost effective solution for your business, tailored to solve your business admin headaches. What are the benefits to employing a Virtual PA / freelance administrator? Cost savings to you are made on recruitment advertising, training and ongoing costs such as holiday and sickness pay. NI contributions, tax, pension etc. are all avoided. You just pay for the hours worked, so you're paying for 100% productivity, and not for quiet times in the business; not even the tea breaks. There is no need to provide office space or equipment for a Virtual PA. I have my own office providing all the necessary equipment and resources required. Although I am also available to work from your office if you're local; sometimes you just have to be on-site to help. You may already have a specific task that you need assistance with; however if you just know you need help but are unsure where to start, have a look at what admin you do each day/week and make a list. I can help you to identify what you could outsource and help you to prioritise. We meet to discuss your admin requirements. A free, no committment initial consultation meeting (up to 2 hours) is available (see below). A proposal is drawn up, and once the contract and T&C’s are agreed, we can get started. You send me the work you need completing in the most convenient way for your business, e.g. 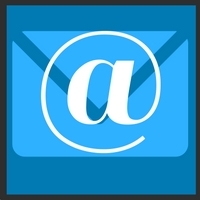 email, shared cloud service, post, meeting, etc. The work is then completed to meet your set criteria and timescale and returned to you via your preferred route. Where the opportunity exists, I prefer to send the work to you for approval prior to final presentation. This will usually be done electronically, by email or via a cloud file storage facility (eg Dropbox, Googledocs, One Drive etc). Of course! A face to face initial meeting is good for both of us to build trust in the business relationship, especially for local clients. However, some work undertaken by AdminAnywhere is completed without us ever needing to meet. A free, no committment, 2 hour initial consultation meeting is available to all my local clients. I am happy to travel to your business address or agreed meeting point, especially if you are in easy reach of Bolton or Bury (Lancashire, UK). Travel costs for initial meetings within a 10 mile radius/or 30 minutes travel time, will be met by AdminAnywhere, but subsequent visits and destinations over 10 miles away, are likely to be chargeable to the client. This will be discussed and negotiated as appropriate. For safety and insurance reasons, personal visits to my premises cannot be permitted and visits to your premises must be an official business site/office (I cannot visit client homes). However a meeting point can always be arranged: coffee shops, cafe's, hotel reception areas are ideal. We need the work done urgently, can you meet the deadline? 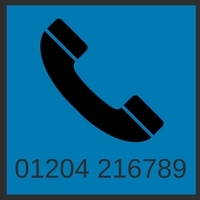 We understand that our clients are very busy, so the admin is often one of those jobs that has been left until the deadline is looming. It's one of the reasons VA's exist. 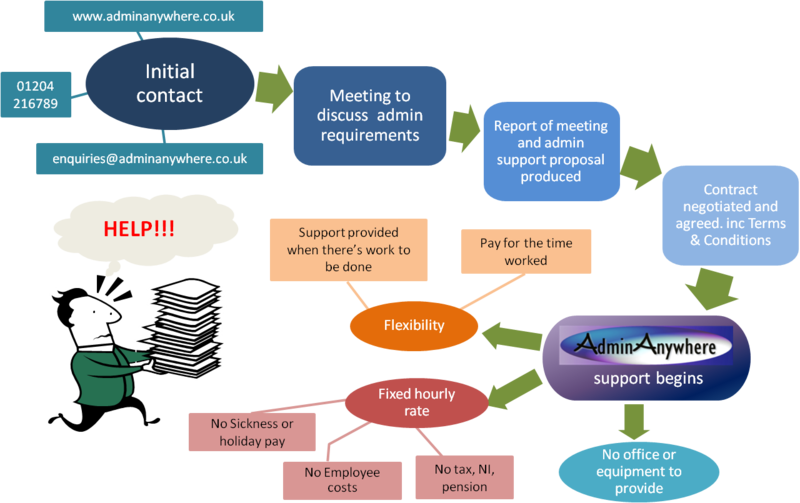 AdminAnywhere will never knowingly undertake work which cannot be completed within the required timescales. The whole nature of AdminAnywhere is to offer a convenient and flexible administrative service. AdminAnywhere is not restricted to the normal Monday to Friday, 9-5 office, which can benefit the client too. However, urgent work completed outside standard office hours may incur extra charges. Therefore, if there is an urgent job that needs finishing, AdminAnywhere is able to work into the evening, during the weekend or even get up earlier in the morning to get the job done and still have time to handle household and family necessities, and walk the dog. Note though that consideration will also need to be applied to other client commitments and scheduling. Do you offer a collection and/or delivery service? Free collection and delivery are offered within a 10 mile radius of my office location. Beyond that distance charges will be relative to the distance and time involved. Alternatively, I can arrange for postage or a courier service to collect from or deliver to your business location. Do we need to supply you with any stationery? If you wish me to print documents on your own printed letterhead or invoice stationery, then you will need to supply this. In most other circumstances you will not need to supply stationery as the office is fully stocked. However charges will be incurred for usage of any stationery supplied by AdminAnywhere. Depending on the task required, e.g. for PowerPoint presentations, newsletters, social media profiles, and other business documentation, the client would need to provide logos and other business pictures/literature in electronic (jpeg, png, etc) format. 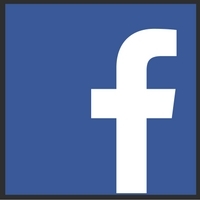 We adhere to the Data Protection Act 1998 and are registered with the Information Commissioners Office under the trading name of AdminAnywhere. We will also comply with the GDPR regulations from 25th May 2018 acting as a Data Processor on behalf of our clients. All work and data stored/processed/transmitted/disposed of, on behalf of the client will be conducted within strict confidentiality guidelines and European regulatory requirements. Client contact data is never shared with other clients and never used by AdminAnywhere for own business purposes. AdminAnywhere respects the wishes of my clients regarding confidentiality. Whilst I love to share experiences of the variety of businesses I support and types of work completed, reference to the actual business name and individuals is kept annonymous unless the client approves me to name them specifically. All client work is stored and backed up securely in a highly secure encripted cloud storage service. Documents can be shared with clients via Dropbox or other cloud storage/sharing suppliers. AdminAnywhere's IT systems are maintained by an IT support & security professional. Anti-malware protection is regularly updated. When a client leaves our service any documentation - electronic and physical - is securely deleted and shredded.